This chilling documentary captures the fight that numerous members of the black American community took to in response to the violent shooting of Michael Brown Jr. As many Americans from all races came to understand, Mike Brown was an unarmed black teenager who was shot several times by a white police officer. This catastrophe in Ferguson, MO set off an intense series of escalations between members of the community and the mostly white police force. I was absolutely appalled and grossly horrified by the footage in this film which I am exceedingly grateful for. 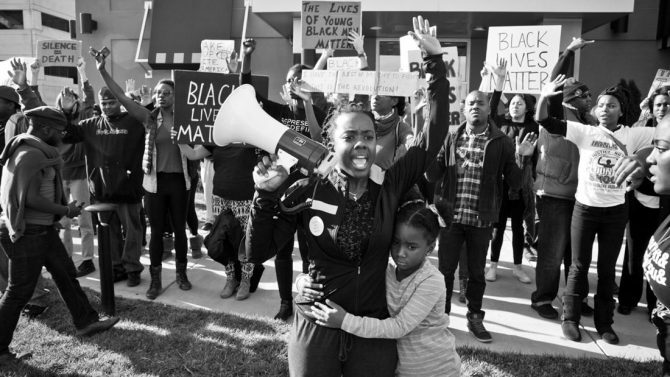 This film is an absolute game-changer that disseminates the truth to all viewers by intimately displaying the concrete events in Ferguson. The death of another black unarmed teenager literally inflames members of the black community as well as white individuals into a constant rage. I, myself, was severely angered by the grotesque circumstances and the subsequent treatment of this majority of peaceful protesters. The entire United States justice system was yet again put into question in my conscience as I relived the witnessing of police brutality. I have overflowing respect for Sabaah Folayan and Sabaah Jordan, the ingenious creators of this barrier-breaking piece of cinema. The very concept of peaceful protesters being basically attacked by the officers with tear gas, dogs, and rubber bullets was beyond disturbing. 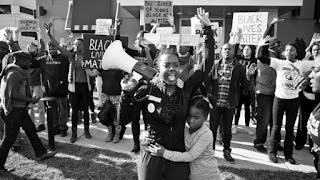 The footage, in my opinion, was a replica-like reenactment of the demented injustices that occurred to black Americans just over fifty years ago. The absolutely shocking revelation by one of the prominent actors in this movement that the police used chemical weapons that were illegal on U.S. soil mortified me. One has to not have a conscience or have a complete depletion of empathy to not feel for the individuals on screen. This movie excels remarkably at blasting the siren of racial injustice and comprehensively invalidates the idea of a post-racial society. Being in the theater viewing such a momentous piece of cinema is so impactful that to me it constitutes a physical experience. A message, through repetition, permeates the entire documentary that basically says that we need to love each other. Enough is strictly enough. The highly visible display of community and affection for one another amongst these individuals exuded compassion. After seeing this utterly incredible film, I am reminded of how Mike Brown had a college experience, a career, a wife, potential children, and a myriad of other things taken away from him by that officer. God bless this movie and may it make its way to the eyes of the vast American society.